Tropical Christmas Cookies These are the perfect cookies to make for gifts for all of your favorite people during the holiday season. They are festive looking with green pistachios and dried red cherries. Throw in white chocolate and freshly toasted coconuts with a dash of lime zest and you have the flavors of celebrating Christmas on a tropical island! I am so excited to be a part of the Fifth Annual Food Bloggers Cookie Swap! Almost 500 other super talented food bloggers joined together to raise money for Kids Cancer and bring to you all sorts of amazing cookie recipes. Each Food Blogger participating made a donation to Kids Cancer and then were matched with 3 other bloggers to swap cookies. Bloggers from all over the world participated in this tasty fundraiser. Our donations were then matched dollar for dollar by these generous sponsors Dixie Crystals, OXO and Land O’Lakes. Pictures of my cookie swap cookies before mailing!! This was the most fun event to be a part of, from trying to come up with something new and different to waiting patiently for my cookies to arrive from my blogger matches. I can hardly wait to see the round up of all of the recipes because if the list of cookies is as amazing as the ones I received you will be making cookies a LOT in the near future. 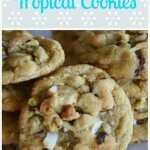 These Tropical Christmas cookies were inspired by some that I tried from Rachel @ Bakerita this summer. Here is the link for Bakerita’s recipe!(WARNING! They are highly addictive!!) She added a lime zest to a cookie and it was just so different than anything I had tried before. I took my mom’s tried and true chocolate chip cookie recipe (which honestly is a tollhouse cookie recipe from way back when), added a bunch of lime zest and switched up the add-ins to reflect what reminded me of Christmas. Translation… Green Pistachios and Dried Tart Cherries. 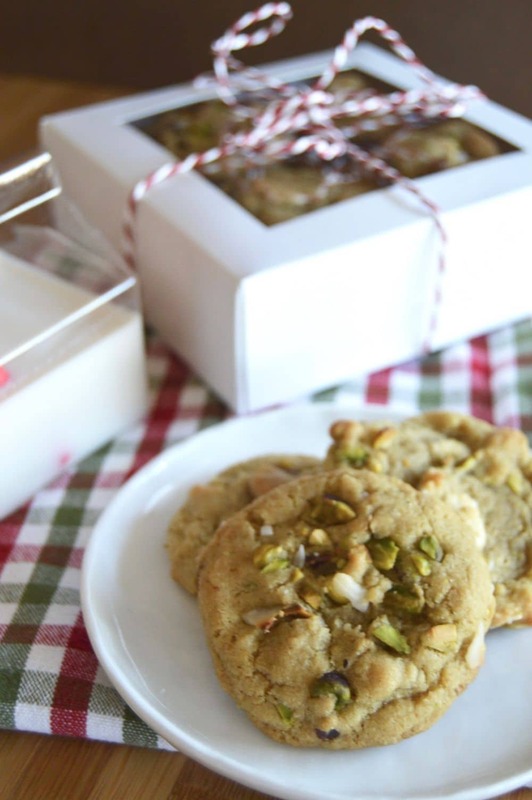 Cherries, Pistachios, White Chocolate and Coconut…..Oh MY! Seriously these Tropical Christmas Cookies are the bomb. They are soft and chewy and filled with some crazy good things. The lime zest adds a tang that is really unique. Each time someone tries them they love the slight tartness of what the combo of lime and tart cherries gives. The addition of white chocolate and coconut balances out the flavor profile so you have all sorts of things hitting your taste buds to make you happy. 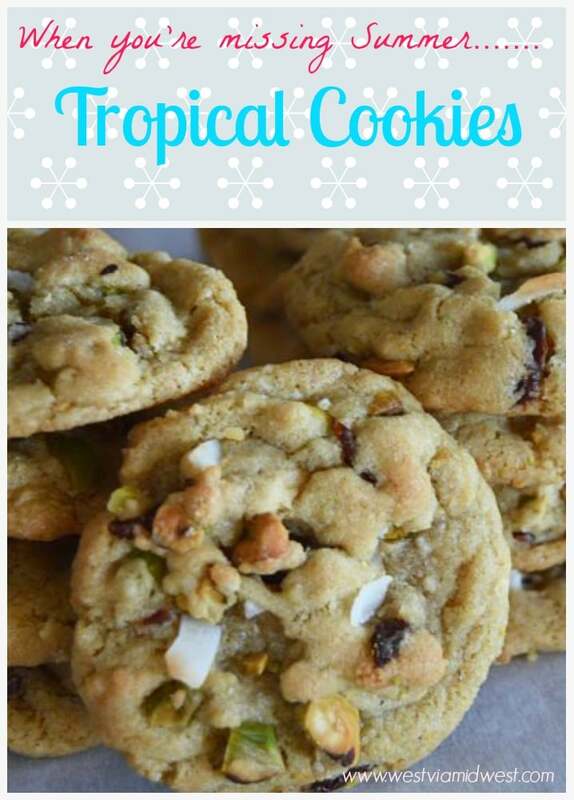 The Tropical Christmas Cookies hold up well for a week or two if you store them in an airtight container so they are great to make to give as gifts. You can send them across country for a special delivery and they are still fresh and tasty when they arrive. In the bowl of your mixer, cream butter, sugars until lighter in color and well blended. Add lime zest and mix well. Scrape down the bowl to make sure all ingredients are mixed in. One at a time add each egg mixing until all combined. Once eggs are incorporated, add vanilla and blend thoroughly. On low, add the flour mixture to wet mixture. Mix until just comes together. Remove bowl from mixer and hand stir in the chocolate, pistachios, coconut and Dried cherries. Place on a parchment paper lined cookie sheet about 1 1/2 " apart. Let cookies rest for 10 minutes before removing them from the baking sheet to a cookie rack to cool completely. Love the combination of Pistachios, Cranberries, Coconut and a lime zest! Oh wow! 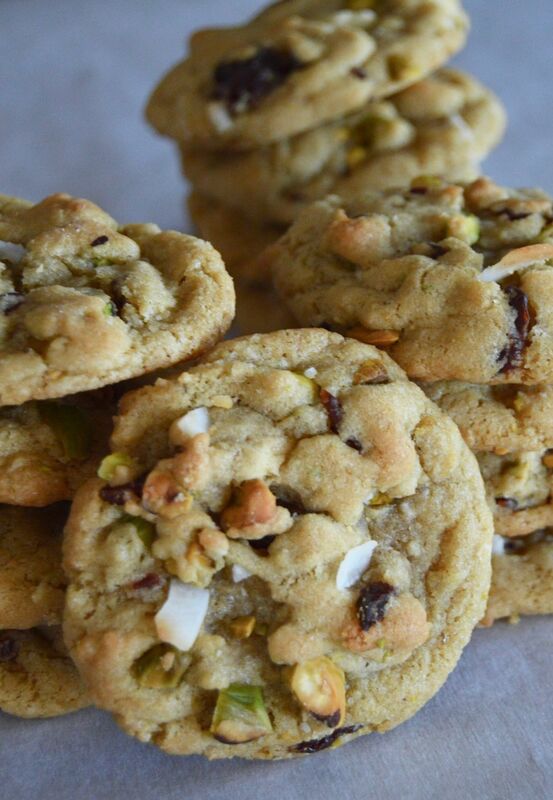 I love everything about these cookies … especially the lime zest! So good! I love pistachios in anything so these look incredible to me! I would have never thought to do a tropical cookie, but you’ve convinced me. Yum! These look so tasty. I missed the chance to make them for Christmas but I will make these for the three birthdays in our family in January. I love your fund raising with cookies! Great idea and what an imaginative cookie recipe! Oh I made these cookies many years ago and forgot all about them! Love the lime zest and coconut together! Yum! Thanks for the reminder. This is a fab cookie recipe, thank you for sharing! I can’t wait to try it!! 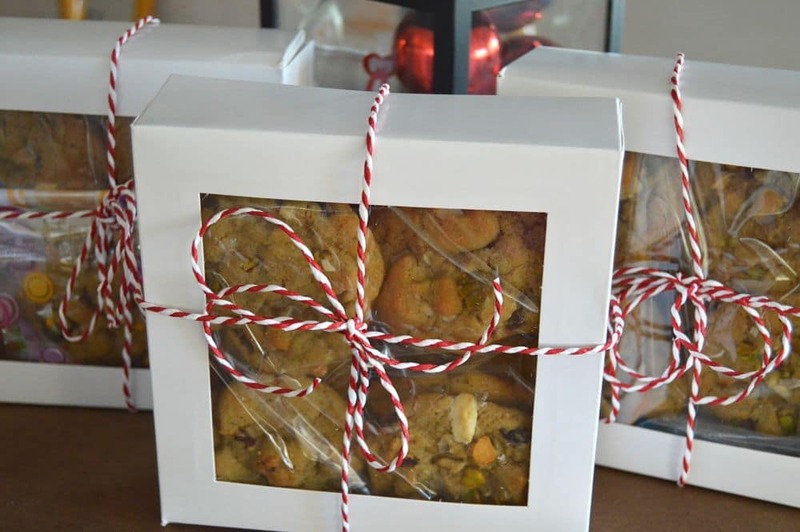 These cookies look and sound amazing — will have to give them a try with the fam this Christmas! I love pistachios so I am definitely trying these. You’re packaging is really lovely too. These sound so good, and different from typical Christmas cookies! I would love to try and make these. These cookies sound so yummy! What a fun cookie swap! Going to try these. Love a cookie swap. This year I put butcher paper down on our long table. Ladies put one cookie each of each kind they brought on the paper and wrote what kind they were and stuff like gluten free etc. The box or plate was above them. Everyone loved it. Just an idea. Thats a great idea…. Thanks Candy! ~m ps… since I have a cookie swap with my girls on Monday I am seriously going to do this! These look fun and festive! I love that they have a little added flavor to them! Saving this to make soon! Those sound delicious. I’m a sucker for coconut and lime, so they are well and truly on my Xmas baking list. These sound SO good! I love that they’re something different from the traditional cookies you see this time of year. Yum! I love tropical and I love Christmas so these look right up my alley! These looks super delicious with all the pistachio, cherries, white chocolate n such a great cause. Well hello there fellow cookie swap blogger. I’m doing that too this year! I totally wouldn’t have minded getting these in the mail! This looks like an awesome twist on a Christmas cookie! These cookies sound absolutely amazing and what a great cause.